Occasionally there may be questions or concerns about the data you see displayed on SAGAGIS. We want to help by getting you as quickly as possible in touch with the person who can help you fully address your concern. Please take a moment to select from our drop down the issue that best describes your concern to see a list of individuals best placed to help you. Thank you. The data you see on SAGAGIS has been collected from numerous governmental agencies and displayed here in a consolidated fashion by the Saginaw Area GIS Authority. Our Assessing Data comes from a combination of databases supplied by the local municipal assessors and the Saginaw County Equalization Department. Specifically, the ownership data, parcel addresses and sales data we display comes from the Saginaw County Equalization Department, with the exception of the City of Saginaw and Saginaw Township which comes from those local assessors. All other assessing data including, but not limited to, tax description, SEV, building data etc. comes from the local assessor. If you have questions concerning this data please contact the local assessor of record. Our Tax Data comes directly form the local area treasurers. If you have questions concerning this data please contact the local treasurer of record. Our Mapping and Parcel Lines are maintained and provided by the Saginaw Area GIS Authority. In some cases (FEMA flood maps, USGS Soil Maps etc.) mapping is provided by State and Federal agencies. If you have questions concerning the mapping portion of this site please contact the Saginaw Area GIS Authority. 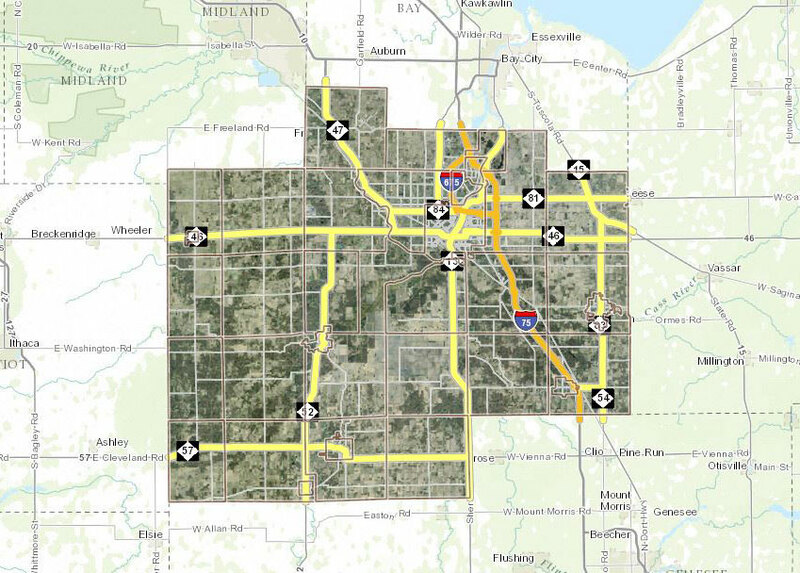 The Saginaw Area GIS Authority provides a wide variety of information for bulk sale to individuals and organizations. This information includes but not limited to Orthophotograpy (Aerials), Planimetrics Data and Cadastral Data. For a full list of our products please click on Services and Pricing. Our map gallery contains a rotating collection of maps of general interest to the residents and business partners of Saginaw County. The selection of maps ranges from bicycle and hiking trails s to zip codes, school districts to commission districts. To view our current selection please click on Map Gallery.